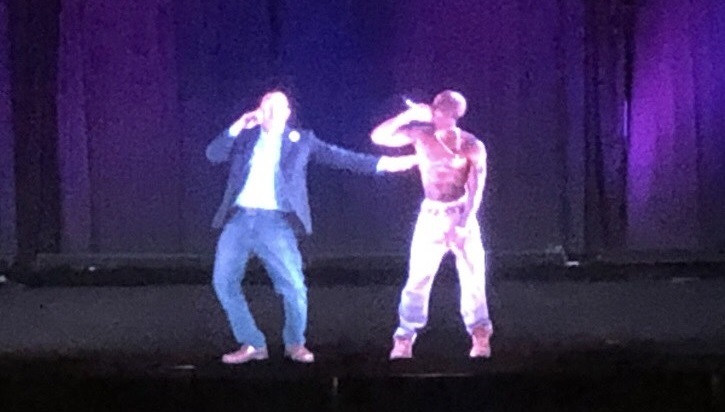 The Democratic candidate Andrew Yang, known mostly for his plan for universal basic income, and for being against circumcision, posted video of himself in hologram form rapping with the most famous hologram of all time: Tupac Shakur, as he appeared at Coachella. He’s revealed his strategy to appear in more than once place at once on the campaign trail, starting with Iowa, via hologram. The video was shot at the Hologram USA offices in Los Angeles, owned by Greek billionaire Alki David. David and HUSA previously worked on Narendra Modi’s campaign for Prime Minister of India. He won that election and the Wall Street Journal credited the hologram for the success of his pro-tech platform. HUSA helped stage 50 to 60 hologram town halls a night across India into which Modi was beamed live. Yang is also running on a pro-tech platform, with specific proposals involving things like Artificial Intelligence and Autonomous Vehicles. His numbers have been rising steadily since his appearance on the Joe Rogan show. The New York Times recently wrote about his ability to pull Trump voters disillusioned with the Orange One’s ability to create actual change instead of just chaos. Yang is the first 2020 candidate to make plans to campaign by hologram but he’s not likely to be the only one. Considering cost of travel and security, and the massive boost in reach by being able to be in dozens of places at once, live and taking questions from audiences, it’s only a matter of time before more candidates jump in with hologram campaigning.